At last week’s Mining Investment North America conference in Toronto, Drew Clark of Metalla Royalty & Streaming shared advice for investors — especially those interested in gold. Drew Clark, vice president of corporate development at Metalla Royalty & Streaming (TSXV:MTA), had advice for investors during a panel discussion at last week’s Mining Investment North America conference, touching specifically on how to navigate production downturns for certain commodities. 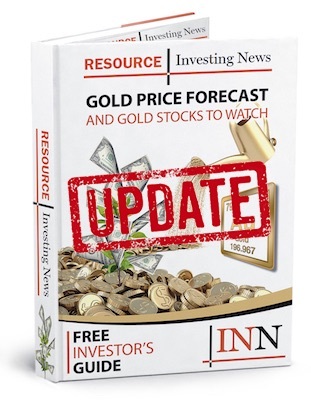 Following the panel, Clark elaborated further in a one-on-one interview with the Investing News Network (INN), speaking about where investors should be placing their bets when looking at gold prospects. “[In gold it’s] becoming increasingly hard to find projects that have scale, and the larger companies are, quite frankly, not backfilling; they’re depleting assets by investing in exploration, so they’re now relying more heavily on M&A than they ever have,” Clark said. “So why that would be important for investors, in my view, is finding good development projects and exploration properties that have a real chance of making a discovery and likely being taken out at a premium,” he explained. Check out the interview above, where Clark shares his thoughts on why the royalty and streaming model is becoming more appealing to investors, what the future holds for the space and what Metalla has on the go right now. The transcript for this interview is available below. INN: Drew, for those who may not be aware, can you explain the royalty and streaming model and why it’s a compelling option for investors? DC: The royalty and streaming space is sort of a new [entry] to the mining investment space that came to fruition about 15 years ago. What’s unique about us relative to producers is we take no capital or operating cost risks when we invest in mines. We are typically taking third-party royalties and passing the cashflow through to investors, as well as buying streams on existing mines where we have the right to purchase metal at a discount, to the prevailing spot price or a fixed price that’s typically always at a discount from the spot price. What’s unique about us is we are able to run these companies with extremely low G&A and generate an immense amount of cashflow when you look at our revenue per employee metric. Take Metalla, for example — on a salary basis it’s myself and the CEO, and we’ve generated probably around $8 million of revenue this year, so that’s $4 million per employee. But what’s more important than that, aside from being financially robust, is we have a long track record of doing creative deals [for] returning capital shareholders, a track record that most mining and production companies cannot match. INN: Metalla’s focus is on gold and silver royalties and streams, but we saw some big news in the space with Vale (NYSE:VALE) signing two cobalt streaming deals. Do you think we’ll see more royalty and streaming deals outside of the precious metals space in the coming months/years? DC: I think you will. Investors like the medium of exposure through a royalty/streaming company as opposed to buying producers, and I think with that you’re going to see companies like Cobalt 27 Capital (TSXV:KBLT), for example, which was part of the Vale deal, starting to deploy capital, as well as Glencore (LSE:GLEN) recently partnered up with teachers to create BaseCore Metals, which is going to be based on a royalty/streaming company. When you start finding investors that want exposure to certain metals, and you start giving them the medium to gain exposure to it, being a royalty/streaming company I think you’ll see more and more companies doing that. Anecdotally, you’ve even seen it in the weed space with Cannabis Wheaton (TSXV:CBW) being created. So I think you’ll see more and more of that for sure. INN: We’re here at Mining Investment North America, and you participated in a panel discussion on depletion in the development pipeline for mining companies. Can you briefly explain how this problem developed and why it’s important to know about? DC: For me, just specifically on gold, gold has always run at a sprint, it has never run at anything but 100-percent capacity, so every mine is always trying to pull as much metal out at a time. Gold is becoming increasingly hard to find projects that have scale, and the larger companies are, quite frankly, not backfilling; they’re depleting assets by investing in exploration, so they’re now relying more heavily on M&A than they ever have. So why that would be important for investors, in my view, is finding good development projects and exploration properties that have a real chance of making a discovery and likely being taken out at a premium, and rewarding investors that have that vision with … in terms of stock gains. INN: Are there any upcoming milestones for Metalla that you want to share to close, or any final thoughts you’d like to leave investors with for 2018? DC: So Metalla’s upcoming catalysts that are the most relevant are related to the Endeavour Silver (TSX:EDR,NYSE:EXK) mine, which is about 90 percent of our cashflow today. We’ve got an updated mine plan that was just released and we’re looking at, internally, how to share the market, how we view that mine before we get down the road. At the same time, we have a pipeline of projects that we’re working on acquiring, and some could be very creative to investors that we’re really excited about. Finally, on the side of Metalla, we’re trading at a pretty big discount to our peers and the industry’s starting to wake up to that, and I think pretty soon you’ll see some continued performance for us based on the fact that we are executing our plan as we laid it out at the beginning of the year, and we’re continuing to pay a dividend to investors while they wait for us to continue to close that valuation gap.